A sense of community "is fracturing across our nation right now, worn down by the petty and vicious nature of our politics," she added. "We are all tired of the shutdowns and the putdowns, the gridlock and the grandstanding." The Minnesota Democrat added it was time "heal the heart of our democracy and renew our commitment to the common good." She also said she will "focus on getting things done" as president. "Let me be blunt: For too long leaders in Washington have sat on the sidelines while others try to figure out what to do about the changing economy and its impact on our lives, what to do about the disruptive nature of new technologies, income inequality, the political and geographic divides, the changing climate, the tumult in our world," she said. "For a moment, let's stop seeing those obstacles as obstacles on our path. Did we view the snow as an obstacle? No we did not. Let's see those obstacles as our path." Klobuchar, 58, is the latest senator to join what is becoming a crowded 2020 Democratic primary field of candidates looking to unseat President Donald Trump. A former prosecutor, Klobuchar is looking to run on her legislative record in Congress, where she is known as a moderate who is willing to work with Republicans to achieve policy goals. Klobuchar, who just won reelection to her third term in the Senate, has pursued legislative proposals that aim to promote social media advertising transparency and lower prescription drug prices and played a prominent role in the recently passed farm bill. She also supports a Democratic Green New Deal proposal to combat climate change. The senator also has a record of electoral dominance in a state that is increasingly tilting closer to the middle. Klobuchar won re-election last year with over 60 percent of the vote in a state that has voted Democratic at the presidential level in every election since 1976 but only narrowly went for Democratic presidential nominee Hillary Clinton in 2016. Klobuchar has won each of her three Senate elections by more than 20 points. Although she is somewhat of an unknown nationally, recent polling in Iowa, the first caucus state, has found that far more likely caucus-goers view her favorably than not. Klobuchar asked Kavanaugh, who faced the allegation that he sexually assaulted a woman, Christine Blasey Ford, when they were in high school, if he ever blacked out from drinking too much. Kavanaugh, who vehemently denied the allegation, responded: "Have you?" He later apologized to the senator, who has said her father was an alcoholic. As news of her impending announcement broke last week, Klobuchar faced criticism for reports of mistreating her staff. Citing anonymous sources, HuffPost reported that the alleged mistreatment scared off candidates to manage her presidential bid. BuzzFeed, meanwhile, reported that Klobuchar "ran a workplace controlled by fear, anger, and shame, according to interviews with eight former staffers, one that many employees found intolerably cruel." "She demeaned and berated her staff almost daily, subjecting them to bouts of explosive rage and regular humiliation within the office, according to interviews and dozens of emails" BuzzFeed reviewed, the publication wrote. But current and former staffers have come forward to defend the senator. 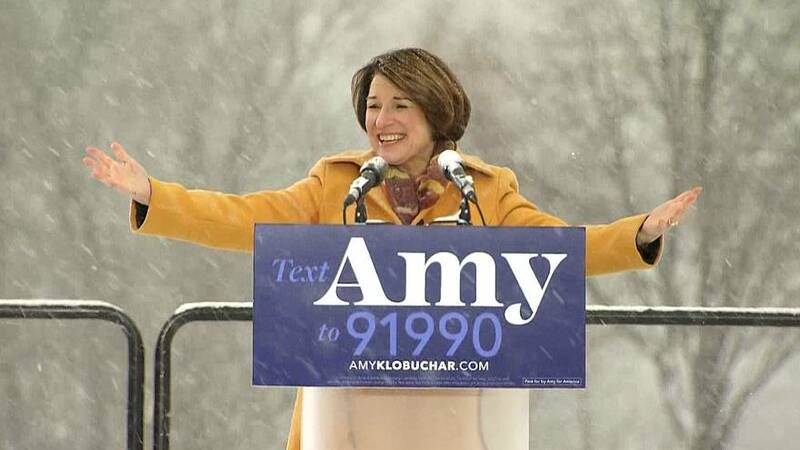 "Senator Klobuchar loves her staff ― they are the reason she has gotten to where she is today," a campaign spokesperson said in a statement to HuffPost. "She has many staff who have been with her for years ― including her Chief of Staff and her State Director, who have worked for her for 5 and 7 years respectively ― and many who have gone on to do amazing things, from working in the Obama Administration (over 20 of them) to running for office to even serving as the Agriculture Commissioner for Minnesota. She is proud of them and the work they have done for Minnesota." Asal Sayas, whom Klobuchar's office referred to BuzzFeed and who was her director of scheduling for three years, told the publication, "Amy was one of the best bosses I've had. I found her to be incredibly fair and extremely effective."